Workhorse Products with it’s line of Precision Screen Printing Equipment has been a dominant player in the textile screen printing industry for decades because we’re committed to our customers’ success. This is made evident by our durability in product design, software with auto-updating features to give you the latest functionality, and our top-rated technical services department. EVER USED A TABLET BEFORE? THEN YOU’RE READY TO PRINT SOME SHIRTS. Workhorse Products has taken the leading role in the screen printing equipment evolution. 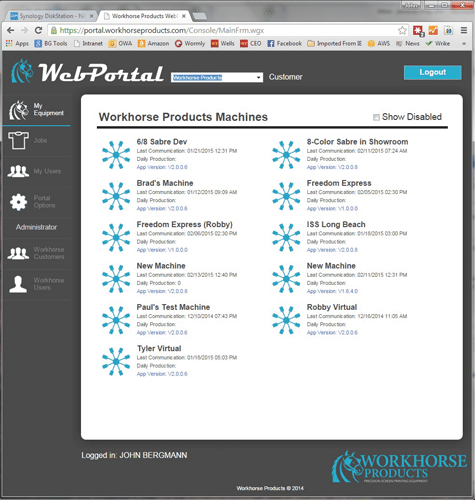 Our Workhorse operating system has carved the path of complete hardware & software integration and communication. 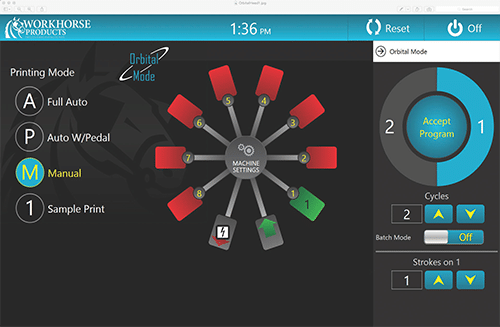 Whether it’s the ability to see what your press is doing at all times from anywhere in the world, or our automatic press software upgrades giving you access to the latest features possible, Workhorse gives you a leg up on your competition. Our graphics based Orbital Programming is the easiest way to use multiple revolutions for high flash requirements, up to 9 revolutions per job! 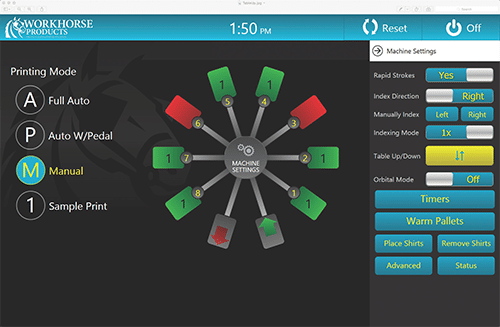 An easy to read, touch menu allows quick and easy access to all machine parameters such as index direction, specialty ink modes, indexing mode, etc. With more flexibility than any other machine, our print head menu is concise and easy to use. 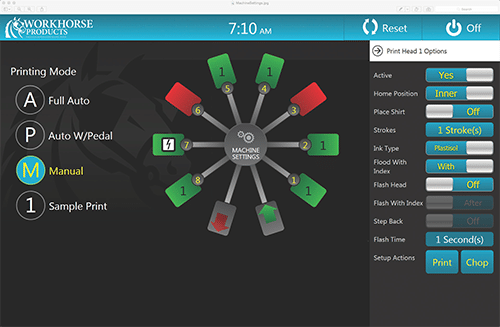 Change print direction, ink type, stroke count, flash time, flash settings and other functions with a simple touch of the control. 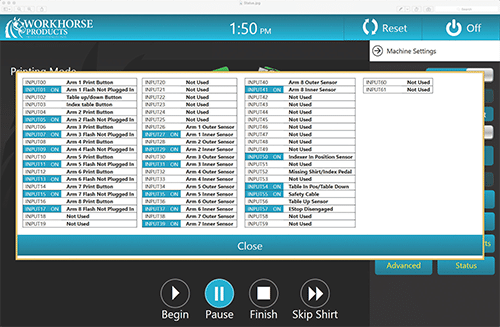 With an intuitive I/O status screen that Workhorse Technical Services can see remotely, any questions that may arise can be dealt with efficiently.